The ripples of discontent that began with the Brown v. Board of Education case rapidly grew into a wave of resistance within the community of Little Rock, Arkansas. 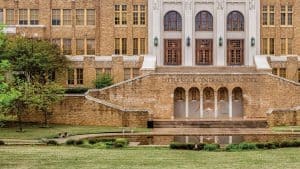 Nine African-American students found themselves in the midst of the turmoil as they enrolled in the formerly all-white Little Rock Central High School. Today, their bravery and perseverance is immortalized through the Little Rock Nine Memorial at the State Capitol. Visitors can also walk the halls of the still-operating school on tours guided by National Park Service rangers, or explore the Old State House Museum housed in the original Capitol of Arkansas.